Daniel Biederman sweats all the details in a crusade to make parks that work. 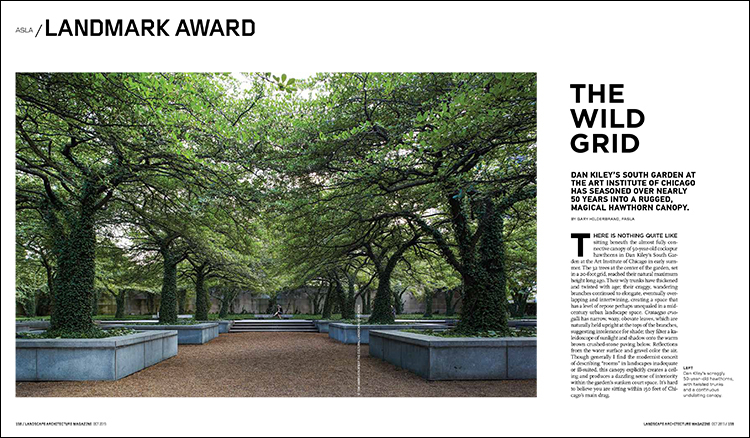 In December’s LAM, Fred Bernstein reports on Daniel Biederman’s quest for the perfect park, and it’s not for slouches. Jonathan Lerner writes about the simple beauty of the Cedar Creek Residence by Hocker Design Group, winner of the 2015 ASLA Professional Award of Excellence in Residential Design. William Saunders takes in OLIN’s rewilding of Mill River in the heart of Stamford, Connecticut. In Interview, Kurt Fristrup, a senior scientist for the National Park Service’s Natural Sounds and Night Skies Division, discusses newly released “sound maps” of the United States; what virtual reality could mean for landscape architecture in Tech; and in Ecology, Norman DeFraeye, the supervisor for Toronto’s ravine and natural feature protection, walks a tough line for nature restoration in the middle of an urban center. And don’t miss our regular Now, Species, Goods, and Books columns. You can read the full table of contents for December 2015 or pick up a free digital issue of the December LAM here and share it with your clients, colleagues, and friends. As always, you can buy this issue of Landscape Architecture Magazine at more than 200 bookstores, including many university stores and independents, as well as at Barnes & Noble. You can also buy single digital issues for only $5.25 at Zinio or order single copies of the print issue from ASLA. Annual subscriptions for LAM are a thrifty $59 for print and $44.25 for digital. Our subscription page has more information on subscription options. Keep an eye out here on the blog, on the LAM Facebook page, and on our Twitter feed (@landarchmag), as we’ll be ungating December articles as the month rolls out. Credits: “Pardon His Progress,” Patrick Pantano; “The Serenity of Straight Lines,” Robert Yu; “Change the Channel,” © OLIN/Sahar Coston-Hardy; “Field Recordings,” National Park Service; “Get Real,” Dan Neubauer; “The Ravine Keeper,” DTAH. Our much-awaited 2015 LAM Product Directory is packed into the December issue, which is free to read through Zinio. In addition to the largest-ever Product Directory, December includes a profile of the work of Larry Weaner, Affiliate ASLA, aka the “meadow guy”; Wagner Hodgson’s new campus addition to Salem State University, a winner of a 2014 Honor Award in General Design; and the imminent threat to Garrett Eckbo’s iconic design for the Fulton Mall in Fresno, California. Elsewhere, new peer-reviewed specifications for planting by Brian Kempf, Tyson Carroll, and James Urban, FASLA, adapt modern practices and contemporary science that can be altered for any region. In House Call, Nancy Owens Studio creates a design in upstate New York for an old friend. And in the Back, we have a look at amazing botanical illustrations from the pages of Flora Illustrata: Great Works from the LuEsther T. Mertz Library of the New York Botanical Garden. And, of course, there’s more in our regular Books, Species, and Goods columns. You can read the full table of contents for December 2014 or pick up a free digital issue of the December LAM here and share it with your clients, colleagues, and friends. As always, you can buy this issue of Landscape Architecture Magazine at more than 200 bookstores, including many university stores and independents, as well as at Barnes & Noble. You can also buy single back issues for only $5.25 at Zinio or order single copies of the print issue from ASLA. Annual subscriptions for LAM are $59 for print and $44.25 for digital. Our subscription page has more information on subscription options. Keep an eye out here on the blog, on the LAM Facebook page, and on our Twitter feed (@landarchmag), as we’ll be ungating December articles as the month rolls on. Credits: “If He Does Nothing, What Will Happen?” Larry Weaner Landscape Associates; “The Tilted Quad,” Jim Westphalen; “Fresno v. Eckbo,” photo courtesy Garrett Eckbo Collection, Environmental Design Archives, University of California, Berkeley; “Plant It Right,” Courtesy Urban Tree Foundation; “Dissolved at the Edges,” Michael Moran/OTTO; “Cabinet of Curiosities,” The LuEsther T. Mertz Library of the New York Botanical Garden, Bronx, New York. In this month’s issue of the Queue, the staff reads up on the grand opening of Dilworth Plaza in Philadelphia by OLIN, wonders at the possibilities of a man-made leaf, and gets down with Greenpeace and Reggie Watts on climate change. Dilworth Plaza’s makeover by OLIN (“Follow the Lines,” LAM, January 2014) opens on September 4 in Philadelphia with new transit access, a fountain (and in winter, an ice rink), art, and Cuban food in what had been a desolate sunken plaza. Harsh contentions arise in a current forensic audit on Great Park, designed by Ken Smith in Irvine, California (General Design Honor Award, LAM, August 2009). According to the L.A. Times, the audit finds that more than $200 million has been spent on the project, yet the park has little to show for it. After the collapse of an earlier plan, the San Francisco Chronicle’s John King reports, the Presidio Trust in San Francisco will release new design concepts on September 4 to generate a fresh public debate on the future of Crissy Field (“At the Presidio, a Field of Schemes,” October 22, 2013). Dezeen reports on Julian Melchiorri, a graduate of the Royal College of Art in the UK, who thinks he’s got long-distance space travel figured out with his new invention—the world’s supposedly first photosynthetic material that absorbs water and carbon dioxide to create oxygen. Looking at climate change and rising sea levels, the township of Choiseul Bay, 6.6 feet above sea level in the Solomon Islands, is moving to where it will be a little less wet in the future. Brad Buchanan is a rancher. He’s also an architect and Denver’s new head city planner. Think pedestrian crosswalk time limits are too short? Planners in Singapore thought so, too, which is why they recently expanded their Green Man Plus program, a system that allows the elderly and disabled to activate extra time for street crossing with the use of a special card. LANDSCAPE 2014, an annual trade event with seminars and a product expo not unlike our own ASLA Annual Meeting, but for the British landscape industry, will take place September 23 and 24 in London. Lines and Nodes, a symposium and film festival that will take on media, infrastructure, and aesthetics, will take place September 19–21 in New York. The heretofore unthinkable L.A. River Boat Race will take place on August 30, and the last kayak trips of the summer are filling up with the approaching September 14 season’s end. You’ve seen London from the skyline, but have you seen it from the treetops? Reggie Watts raps for the future of our planet for Greenpeace. If you can’t find this bus stop in Baltimore, then you’re not looking hard enough. World’s first “unstealable” bike calls to mind claims made by a certain “unsinkable” ship.